An explosion on the Battleship Maine while it sat in Havana Harbor was blamed on Spain as an act of aggression and triggered the Spanish-American War of 1898. 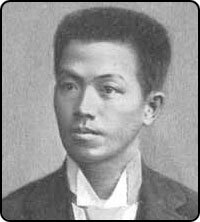 In the late 1800s, Jose Rizal founded the Filipino League, which began fighting Spanish colonial rule of the Philippine Islands. Emilio Aguinaldo succeeded Rizal after his execution and led negotiations with American officials George Dewey and Spencer Pratt to join forces against Spain. Thus the Spanish-American War of 1898 came to be fought on two fronts, in the Caribbean and in the Pacific. However, Filipino representatives were barred from participating in the Treaty of Paris negotiations concluding the war. And under the treaty, the United States purchased the Philippines for $20 million. As American nationals, Filipinos could travel relatively freely to and within the United States. They did so during roughly three waves of migration to Hawaii and the mainland. In the first wave, young Filipino men went to the mainland as students, sponsored under the Pensionado Act of 1903. A few years later, the Hawaiian Sugar Planters' Association began recruiting workers to fill the labor gap that had been left by Asian worker groups. The U.S. Census registered that from 1909 to 1931, 112,828 Filipinos arrived in Hawaii. Although the majority of these were known to have returned to the Philippines or stayed in Hawaii, more than 18,000 migrated to the mainland, mostly to the West Coast, finding work in the agriculture fields and fisheries. In California during the 1920s and 1930s, an anti-Filipino movement developed, arising both from the Depression and from the same resentment on the part of workers of European descent that other ethnic groups had faced. Legislation was passed in California that made marriage between a White and a "person of the Malayan race" illegal. But it wasn't until the passage of the Tydings-McDuffie Act of 1934 that Filipinos faced any legislated restrictions on their ability to immigrate to the United States. The Tydings-McDuffie Act put the Philippines on the path to full independence and changed the status of all Filipinos from "national" to "alien." A quota was established of 50 Filipinos allowed to enter per year; regardless, all foreign-born Filipinos were ineligible to become citizens under the 1790 Naturalization Law. The 1943 immigration reform increased the quota to 100 per year. But, as with many other nationals, it wasn't until after 1965 that Filipinos could gain entry without strict bias placed against their nationality. Little is known about Filipinos who passed through the Angel Island Immigration Station. Many records were lost when fire befell the administration building in 1940, and particularly few records remain to provide details of the experiences of Filipinos at the immigration station. Given their status as American nationals up until 1934, however, they most likely were not detained for much longer than the time needed for medical examinations and quarantine inspections.